This week in CorbynLand we’ve seen the British Labour Party rewrite the definition of antisemitism to allow their bigots to discriminate against Israel as a right of free speech. Until the establishment of the State of Israel, Jews were discriminated against in all parts of the world. Along came Israel and it became the Jew Among Nations. Long before the IHRA came up with its definition of antisemitism, one of the world’s most famous prisoners of conscience, Anatoly Sharansky came up with his own “3D Test” for antisemitism. The symptoms were: Delegitimization, Demonization, and Double-standards. Which happens to fit exactly with the conduct of Corbyn and his supporters towards Israel. Corbynites regard Israel as an illegitimate state, born in sin. 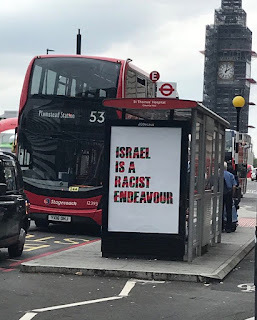 They demonize it as racist and apartheid. And they require it to behave very differently to any other country on earth. A fifth of the world’s countries have official state religions, including 27 Muslim and 13 Christian. But for the likes of Corbyn there is no place for even one single Jewish state, however tiny and however hunted and endangered its people may have been for all time. Even rooted in its biblically-certified homeland, it is for the likes of Corbyn illegitimate and illegal. When the fledgling state of Israel turns out to be the only pluralist democracy in the entire region; when it absorbs millions of immigrants from Russia, Africa and Asia; and when it appoints Arabs to its parliament and supreme court, you might expect other free and developed nations to support and protect it like a precious jewel. Instead, quite the opposite, Israel is demonised as an apartheid state with a Nazi army. When Israel is surrounded on all sides by murderous enemies who have tried 7 wars to destroy it in as many decades; when it is threatened with nuclear annihilation by a fanatical Iranian regime and faces daily security threats in its streets, buses, pizza parlours and airliners, you would expect others to recognize its unique defence needs and to cut it some slack for the occasional stray bullet or collateral damage. But no. For the Jewish state every accident is a war crime. Half a million may be wantonly massacred in Syria and Yemen, but only Israel merits a Goldstone enquiry. A truly monstrous double-standard. So, it’s plain to see that Corbyn’s idea of ‘free speech’ on Israel passes the 3D Test of antisemitism with straight A’s. I am a realist and accept that there will always be prejudice and pejoratives thrown about in any cultural mix. So, my preferred definition of an anti-Semite is someone who hates Jewish people more than absolutely necessary. The same applies for Israel. It’s a young and tiny state which has had to face up to challenges that no other country has faced, least of all within just two generations. Criticise it more than absolutely necessary and you are a bigoted racist abuser of the Jew Among Nations. With Jews like this - who needs Ayatollahs?